Campaign finance disclosures were due earlier in the week and it’s always a good idea to find out who “owns” our elected officials. I took a look at Assemblymember Rob Bonta’s backers and while unions are by far his biggest contributors, he has also taken a fair amount of money from insurance companies. 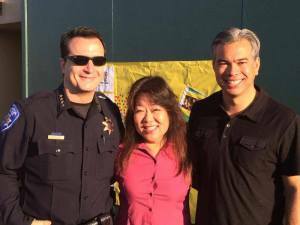 After spending hundreds of thousands of dollars to get Bonta elected in 2012, police unions continue to support him. It’s not a surprise. Bonta has a been an advocate for the militarization of the police, while in the Alameda City Council he voted in favor of acquiring an armored personnel carrier and while in the Assembly he has refused to carry any legislation that would put any type of limits to police power. Other contributors include gambling interests, lawyers, AT&T and, of course, California Waste Solutions. In all, Rob Bonta took in almost $200K in the last 3 months and over $550K this year alone, even though he is running for re-election against San Leandro’s own Republican David Erlich who has raised less than $5K. So what has Bonta done with this money? He’s given the Democratic party about $85K, as it’s expected and, he’s supported other candidates. In San Leandro, his largess went to two candidates: Benny Lee and Deborah Cox. They both got $1K. Not surprisingly, they are both heavily backed by the police department and are expected to rubber stamp whatever the police puts before them (Lee has so far). One person Bonta has not endorsed is Councilmember Pauline Cutter, who is running for Mayor of San Leandro . Now, everyone in the Alameda County Democratic Party and the Alameda Labor council, in addition to the political establishment in San Leandro, has rallied behind Pauline. While she is not the most progressive candidate, she is a solid Democrat, a hard worker and the most independent member of the City Council. She is not a rubber stamp for the City Manager/Police Chief, which is why the Police Union endorsed Diana Souza. If Bonta wasn’t in the pocket of the police union, he would have likely endorsed Cutter by now. Endorsing Souza would be a losing proposition, after supporting the raising of the Chinese flag, voting in favor of red light cameras and taking money from California Waste Solutions (CWS), Souza is likely to come out third on the race, behind Dan Dillman. Bonta’s support of pro-police/pro-Chinese flag/pro-CWS candidates extends to his home city of Alameda, where he is now backing Stewart Chen. Ultimately, politicians cater to their backers because they help them not just be elected, but become more powerful within the political structure. As long as voters automatically elect incumbents, this will remain the case. But the open primary system may make it easier for Democratic candidates to lounge successful challenges against Democratic incumbents – in particular when these tacitly support unpopular positions such as raising the blood soaked Chinese flag over our cities. These are Mike Katz-Lacabe‘s tweets from the City Council 9/15/14 meeting. Since the Council eliminated minutes, the only written record of what happens are Council meetings are Mike’s tweets. The Sept. 15th meeting featured two sets of public speakers, one speaking for paying ACI workers a living wage and another against the militarization of the SLPD and the purchase of the armored personnel carrier. 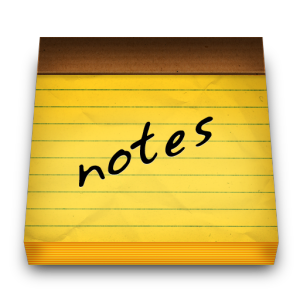 Tweets are organized thematically, not necessarily chronologically. Public speakers at San Leandro City Council meeting now speaking against armored personnel carrier. Public speaker at San Leandro City Council says she called police to check on possible intruder. Showed up in military gear – scared her. Cynthia Chandler at San Leandro City Council notes de-militarization of Richmond Police, resulting in less crime and less violence. Mike Chase of ACLU NorCal at San Leandro City Council wants discussion/transparency about armored personnel carrier/police militarization. Oakland resident who volunteered at Urban Shield thinks armored personnel carrier is unnecessary for police. Mayor Cassidy suggests putting armored personnel carrier on agenda in Jan/Feb 2015 & town hall mtg – council agrees. Despite San Leandro’s living wage requirement, ACI workers are paid less than $10/hour. They are at City Council meeting to speak out. In San Leandro, Alameda County Industries (ACI), a local garbage company, contracts with a staffing agency for its workers. Public speaker says she has worked for ACI since 2012 but is a “temp” worker. She was surprised to learn about San Leandro’s living wage. Mayor Cassidy allowing additional time during public comments for ACI workers who need translation. International Longshore and Warehouse Union (ILWU) is helping organize ACI workers in San Leandro, who get min. wage, not living wage. Jennifer Lin of EBASE speaks on behalf of San Leandro ACI workers during public comments – worked on city’s livable wage. Pamela Fobert, wife of San Lorenzo School Board trustee, is speaking on behalf of Alameda County Superintendent of Education candidate Helen Foster. Not in the tweets, but our daughter Mika Lacabe also spoke on behalf of write-in Mayoral candidate Rascal, her Tasmanian devil stuffed animal. Update on the medical marijuana dispensary operator selection process now at the San Leandro City Council meeting. Final recommendation for San Leandro marijuana dispensary operator expected in Spring 2015. Vice-Mayor Benny Lee appeared before the Oakland City Council to speak in favor of giving Oakland’s trash contract to California Waste Solution, a move that would cost San Leandro millions of dollars, as Waste Managment has its transfer station here. San Leandro Councilmember Prola suggests City Council pass resolution urging Oakland to re-open waste contract. Not enough Council support. San Leandro City Manager Chris Zapata says he is meeting with Waste Management tomorrow about the Oakland waste contract. San Leandro’s newly-formed ad hoc committee will review and make recommendations on City Manager’s performance evaluation and contract. San Leandro City Council unanimously approves nine-member arts commission. San Leandro City Council unanimously approves installation of two electric charging stations at parking garage & one station at water plant. Business Improvement District (BID) for San Leandro LINKS ballots go out this week. Public hearing set for Nov. 3. 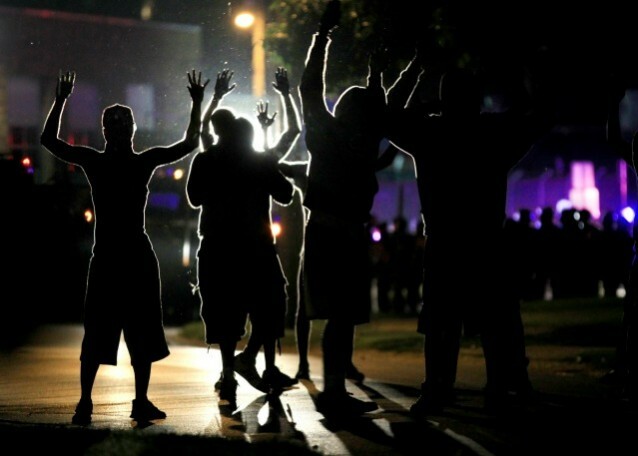 The New York Times has a story,titled “Around St. Louis, a Circle of Rage” about how police harassment and political ostracism of African-Americans has given fuel to the protests we see in Ferguson. You can substitute “Oakland” or “San Francisco” for St. Louis and get the same story. People of color – mostly, but not exclusively, African-American – are tired of having their children shot and being the object of police harassment. When you add to these issues, the fact that the middle class is being decimated, that jobs and opportunities for youth are disappearing and that America is no longer a democracy, we have a volatile situation. The federal government, owned by Wall Street, has responded by militarizing the police and creating a surveillance state to try to identify leaders-in-the-making. As the NYT said in another article, the protests in Ferguson suffer from lack of leadership. 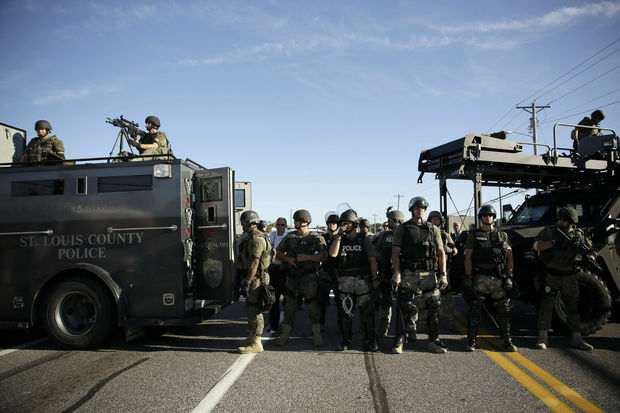 The repression of peaceful protesters and journalists in Ferguson should not be considered casual. It”s intended, at least in part, to serve as a warning to other communities that may rise up and specially to the middle class, which still has something to lose. State terror exists because it works. All this week in Ferguson, a suburb of St. Louis, not too unlike San Leandro, we have seen the consequences of the militarization of police. Peaceful protesters are met with tear gas, batons and even guns. When some people take advantage of the situation to loot, the Police, rather than protect the businesses, used it as an excuse to further repress the protesters. Meanwhile, the civilian authorities back the police and excuse their behavior. After talking to San Leandro City Manager Chris Zapata, it became clear that he would support the SLPD no matter what they would do. When I asked him for an example of a situation when he wouldn’t support them, the only one he could come up with was building them a $60M new facility – but only because the City can’t afford it. But ultimately, we have ourselves to blame for not taking advantage of the opportunities that democracy brings us. The Ferguson and San Leandro councils are pro-police because people of color, young people and even young parents don’t vote. Only a quarter of San Leandrans are white, and yet whites make up the majority of the voters. The median age of voters during the last election was 50; it’s likely to be higher this November. Now, I understand the reasons for not voting, the feeling of complete disenfranchisement, of choosing between candidates that are too similar and all are saying the same thing. But it’s a vicious cycle, candidates appeal to the elderly/scared crowd because they vote. If we don’t vote, we don’t have a voice. This November, let’s break the circle. Please, please, please, encourage, nag, bribe, embarrass your children, your friends, your family members, your neighbors, your students, your co-workers and business acquaintances into voting. If all candidates are bad, do choose the least evil. Maybe next time someone with views closer to yours will run. But voting gives you some immediate power. Politicians only care about people who vote. Candidates for office will buy a voter list that indicates in which elections each registered voter voted. They will only call you, knock on your door and send you mail if you are a frequent voter or newly registered. If you don’t vote often, you don’t exist – your opinions don’t matter. But if you do, when they call you, knock on your door, etc., they will pay attention to what you have to say. In San Leandro, we are fortunate in that we have some candidates who have clearly spoken against police militarization: Dan Dillman, who is running for Mayor and Mike Katz-Lacabe and Mia Ousley, who are running for City Council. If you want to prevent what happened in Ferguson happening in San Leandro, voting for them is a start. After an incredibly intensive campaign, all I can say is that I’m glad it’s over 🙂 I’m no great supporter of Obama, but of course, I’m glad he’s won. Romney would have been much worse. But let’s not kid ourselves. Our country is going in the wrong direction in many ways. I read somewhere that this election was a battle between a member of the 1% and a servant to the 1%, and I think that’s right. The 1% definitely have gotten richer and more powerful under Obama. The Occupy movements that surged last year might have fizzled out, but the anger and desperation of much of our community is still there. As things get worse and worse for the middle class – and let’s be clear, the pie is fixed, the more the rich have, the less we do -, the greater the likelihood for social disruption. Obama’s government is getting ready for it. Already, police departments all over the country – even in the allegedly liberal Bay Area – are becoming para-militarized. 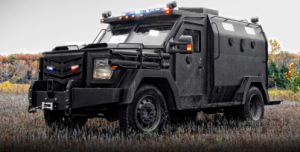 They are acquiring weapons and vehicles – like the Ballistic Armored Tactical Transport (BATT) – which are used in situations of extreme internal disturbances. They are also creating a full surveillance society. Right now many Police Departments in the Bay Area are using so-called license plate cameras (but which actually photograph wide areas around cars) to keep a record of the movements of every person who drives or rides in a car. Hundreds of pictures are taken of each car a year, and are then stored indefinitely, allowing the police to easily track the movements of citizens, know where they go, find their secrets (let’s not forget about the FBI files on Martin Luther King). That’s not enough, however. Currently the San Leandro Police Department (SLPD) is using traffic cameras to record the movements of cars, and wants to install surveillance cameras throughout town. The details of what they’ll do with them have not been released. Meanwhile, the Alameda County Sheriff Department is acquiring an unmanned drone that will allow them to spy inside buildings. The para-militarization of the police also requires training, so police officers have started to conduct joint tactical exercises with the military. The pretext, of course, is “fighting crime” – just like the pretext for doing away with habeas corpus and due process rights is “fighting terrorism” – but let’s not be naive. This technology, in the hands of para-militarized police forces, is to be used for social control. I know to many people this may seem like silly conspiracy theory. If I suggest that you look at what happened in Germany in the 1930’s (and Eastern Europe afterwards), you may recall Godwin’s Law. But at least take pause and think about it.